The “heavy duty” member of the Pallet Inverter family, the RR Type 1 is specifically designed to handle wide or heavy loads. All RR Type 1 machines are painted with two coats of zinc primer and a 2 pack epoxy acrylic top coat as standard. Each RR Type 1 pallet inverter is built to customer requirements, usually with dual clamps and a load capacity up to 10,000 Kgs. 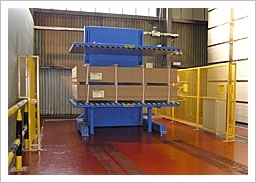 The particular style of pallet inversion makes the unit the obvious choice for loads such as steel or board over 2 metres in width. We always recommend automated controls with the RR Type 1. The touch of one button initiates a clamp, recline and rotate sequence. Your machine would have a fixed location where it would be surrounded by fixed guards and photo-electric beams.